In the boxes: Korean dumplings, cucumber sushi, grapes, longan & fried mee tai mak. 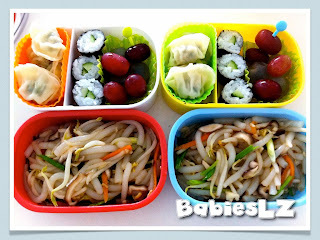 Feeling tired so prepared simple lunch boxes for the kiddos. Z asked for sushi as well so added in the sushi for him, otherwise he will 'complain' why no sushi for such a long time. L's Abstract Artwork & More Painting..